Twelfth Street Rag rules the Pop Charts on its way to becoming the biggest hit of 1948. The ragtime song originated in the last years of the nineteenth century written by Euday Bowman for a friend who was opening a pawn shop. Bowman didn’t publish it though for fifteen years and when it was purchased by a Kansas City publishing company in 1913 the arrangement was simplified and it was heavily promoted leading to it becoming a local hit. In the late 1920’s it reached its widest acclaim when both Bennie Moten and Louis Armstrong recorded hit versions and it became acknowledged as a jazz standard. But by 1948 ragtime was long since dead and jazz itself was on the downturn commercially. Trombonist Pee Wee Hunt who specialized in humorous songs only recorded it himself as “a lark” after his rendition that poked fun at the song was so well received when his band played it at the Hollywood Palladium. He then was astonished when the record sold three million copies and was #1 for eight weeks that fall. Milton Berle is made permanent host of The Texaco Star Theater on television and the show’s subsequent popularity is deemed to be largely responsible for the huge increase in television sales that made the medium a success. Berle had actually been one of a handful of revolving hosts when the program first aired in June, 1948, after taking over the long running radio version that spring. But all of the TV hosts were on a trial basis as the program attempted to establish itself over the summer with Berle winning out, though the ratings had still been modest. That changed when the fall season premiered as Berle understood the format required non-stop action and visual humor to set it apart from radio, where verbal wit and well-crafted jokes centered around established personalities had been the accepted approach for more than a decade. By contrast Berle’s madcap style with plenty of sight gags, outlandish costumes including an abundance of cross-dressing, lots of mugging for the camera and an overall spirit of barely controlled anarchy was designed to ensure eyes stayed glued to the set. With so few homes owning televisions word of mouth about his zany antics quickly spread and as a result those who had yet to buy a set were forced to go to relatives or neighbors each week to see what the fuss was about. The more people who were gathered in a room caused a ripple effect with the humor, as the laughter became contagious and even propped up the misfires. It became a true event to watch and the buzz surrounding it only made the urge even stronger among those still holding out to get a television to not miss out on the biggest social event of the week. At its peak in 1949 80% of all televisions on Tuesday nights from 8-9 were tuned to Berle and cities reported water pressure dropping rapidly when commercials came on as everybody hurried to use the bathroom before the show returned. 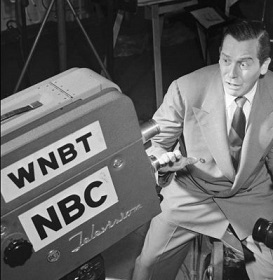 Some critics have chalked up Berle’s initial success to a variety of reasons having less to do with his own ability and more to do with the novelty of television itself which he was able to dominate due to a lack of alternatives on the air. There was also the belief that he was helped by the fact that the majority of the households owning a set in the early days were eastern cities with much higher Jewish populations who were more attuned to his brand of humor and therefore when the rest of the country eventually got wired for TV his popularity inevitably declined. But the fact is it was Berle who was most responsible for spreading television’s popularity in the first place so that it eventually reached the rest of America. 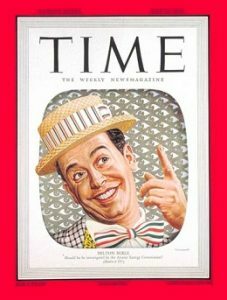 Even with the increased diversity among viewers in years to come Berle still had the #1 show in 1951, the #2 show in 1952, was Top Five in both 1953 and 1954 and just missed the Top Ten in 1955, a year before he left the air. The newly formed Television Research Institute predicts that by 1955 movie theaters will be virtually empty due to what they estimate will be 24 million TV sets in people’s homes. The numbers themselves proved accurate when it came to television’s ubiquity in the home, but film adapted to the challenge with a variety of methods including a brief 3-D fad, longer more epic productions and changes in aspect ratios such as Cinemascope to emphasize the far greater screen size than the still tiny television monitors could offer. 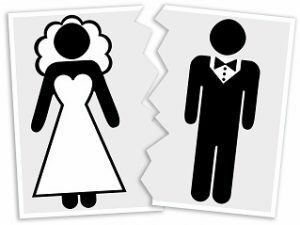 It’s announced that divorces for 1947 are down significantly with “just” 471,000 ending their marriages compared to 1946’s record high of 610,000. The divorce rate reached its peak in the three years following World War Two (1945-1947) with all three years topping 30% (and 1946 topping 40%), likely the result of too many hasty marriages between departing soldiers and their sympathetic sweethearts in the preceding years. The rashness of their decision to wed became all too apparent when the husbands returned from overseas and the couples who’d barely knew each other prior to getting hitched discovered they had no real compatibility. The numbers continued to decline – with 1948 winding up at 28% – and then held reasonably steady until the mid-1960’s when the stigma of divorce lessened and now more than half of all marriages don’t follow through on “til death do we part”. Headlining nightclub comedians Dean Martin & Jerry Lewis sign a five year film deal with Hal Wallis for $1,250,000 to star in two pictures a year. The duo formed in the summer of 1946 after meeting the year before while working clubs, Dean as a singer, Jerry as a comedian. After bombing with their opening show the two began to ad-lib and immediately hit their stride, with Martin’s calm demeanor and suave persona unperturbed by Lewis’s crazed, childlike persona. They quickly became stars on the club circuit, then moved into radio and eventually television, but their seventeen movies made between 1949 and 1956 remain the most easily accessible evidence as to their chemistry which made them the most successful act of the early 1950’s. Ten years to day after first appearing together the duo broke up and the two didn’t speak to one another for twenty years until Martin surprised his former partner with an emotional appearance on the annual Jerry Lewis Telethon for Muscular Dystrophy in 1976. Kellogg’s introduces Corn-Soya cereal nationwide after test runs in selected areas. A big believer in soy products because it was so high in protein this became Kellogg’s signature product along those lines but even with extensive promotion over the next few years it never really caught on. The look of the cereal, which resembled noodles, and the ridiculous name couldn’t have helped sales much and production ended in 1959. They did come up with this tag-line though for commercials which is either catchy or convoluted depending on how much you like corn. When mornings grow crisp, send ’em off to school feeling o-boya! Give ’em substantial Corn-Soya! Chalk it up as a failure of marketing. Red River hits theaters, one of the greatest westerns ever made, firmly establishing John Wayne as the quintessential movie cowboy and elevating him to one of the most bankable actors in the world for the rest of his career. The film also made a star out of Montgomery Clift, whose good-looks, moody persona and method acting technique captivated young audiences in the role of Matthew Garth the surrogate son of Wayne’s tyrannical Tom Dunson, who relentlessly rides the boy throughout the film in an attempt to make him in his own image until the two violently clash on a cattle drive with Garth taking over the herd and leaving the vengeful Dunson behind. Tom Dunson (John Wayne): You should’ve let him kill me, ’cause I’m gonna kill you… I don’t know when, but I’ll catch up. Every time you turn around, expect to see me. ‘Cause one time you’ll turn around and I’ll be there, and I’ll kill you, Matt. One of the best films of Howard Hawkes legendary directorial career, Red River is often referred to as the first modern western, with the main characters representing the two factions that symbolized the divide between the eras in the movie industry. The establishment’s old adherence to external action as a film’s main draw as epitomized by Wayne, while Clift’s internal performance and emotional nuance offered an early look at the type of cinematic approach that would dominate the latter half of the 20th Century. Who knew light bulbs used to be so difficult to buy? 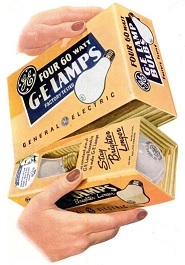 General Electric has solved that problem that had plagued shoppers ever since the invention of electricity with their innovative Four Lamp Package of light bulbs. No longer do you have to buy each bulb individually and have a salesperson test them to make sure they work, then wrap them one by one to keep them secure. The convenient box also ensures they won’t break on the way home and can be stacked in your cupboard for easy access when you need them! Best of all they cost just 48 cents for a box of four. All of this was made possible by General Electric’s Lamp Research in their never-ending quest to Stay brighter longer!